Coming up with an amazing cactus garden design for your landscaping at home is a great idea. Cacti and succulents are in fact the best plants for landscaping. These plants do not require a lot of maintenance and they can thrive well in any given climate. Furthermore, they are easy to grow and care for. Depending on the variety of cactus plant that you intend to grow, the plants can tolerate neglect, and thus, they are perfect for those who do not have the luxury of time to tend to their garden. Cacti plants vary in color, shape, size and growing habits. Choose the variety that is compatible with the cactus landscaping ideas that you will go for. You will also find flowering varieties that produce colorful blooms and can make your landscape look even more beautiful. And although most species of cactus are native to a desert environment, a lot of them can tolerate all kinds of growing conditions. Whether you are planning to grow the cactus in your front yard, backyard, or pretty much anywhere in your house, these cactus garden ideas should help you get started with your landscaping. Your front yard is the first thing that people sees when looking at your home. Thus, it’s important that you make a good impression by coming up with a beautiful front yard landscaping. Cactuses are amazing plants and can help to make your front yard to stand out. Depending on the variety, there are those that produce abundant blooms as they mature. Adding the cactus in your front yard landscaping is just similar to adding any other plant, except that they have a much longer life expectancy. Therefore, you should give them enough room to grow. Grow them in areas that will not pose safety hazards in your front yard. Although most cactuses can flourish under a bright hot sun, this may not be true for all varieties. There are those that that can thrive better under the shade. Also, most of them are slow growing so you need to know exactly how much space and light the plant will need before you include it in your landscaping. Cactuses often have shallow root systems. Therefore, watering should be given utmost consideration. Drainage is also vital to the growth of the plants since they cannot tolerate constant wet soil. A good idea is to plant them in a spot along with other low watering plants so it gets watered infrequently. If you need more ideas and inspiration for your cactus front yard landscaping, then you better check out these cactus garden design ideas for the front yard. 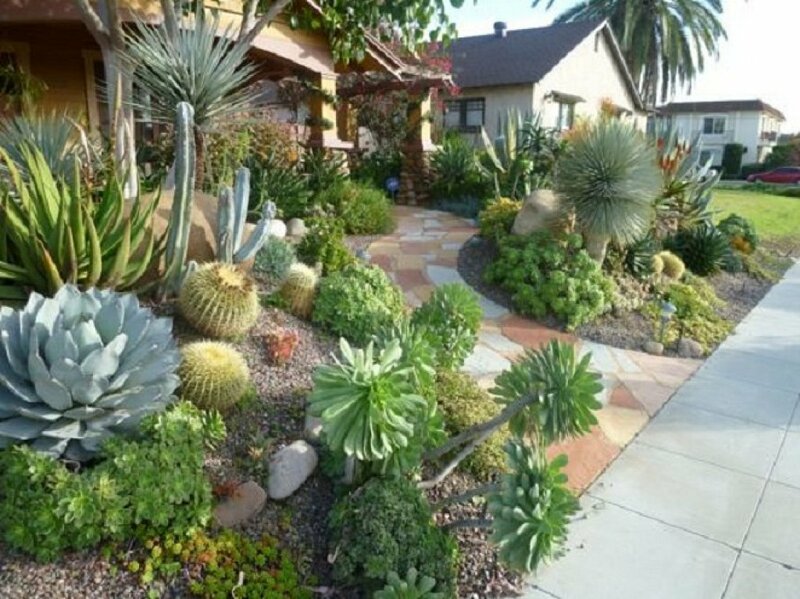 A garden of cactus and succulents in the front yard. Beautiful cactuses by the front yard walkway. Large varieties of cactus in the front yard. Golden barrel cactus and a variety of succulents. 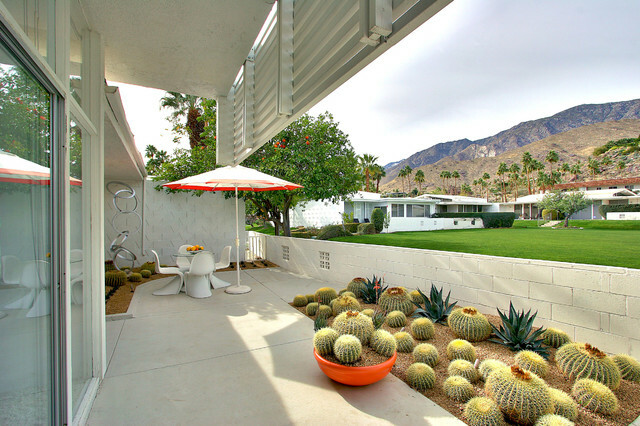 Magnificent front yard landscaping of cactuses. A large barrel cactus adorn the front yard landscaping. The cactus plants can also work well for your backyard landscaping. Just like the succulents, the cactus plants are enjoying popularity in the industry of garden landscaping. Beginners and experienced landscapers would love to include these plants in their garden landscape design simply because of its exotic beauty and its ability to withstand any climate. One of the most popular backyard landscaping ideas is to use pebbles and rocks. When landscaping with cactus and rocks, opt for those varieties of cactus that have golden spines and those that glow under the sunlight. Aside from rocks, you can also incorporate gravel and some wildflowers in the landscape design. Desert shrubs, perennials and other succulents can also be included in your backyard cactus garden design. If you are a pro at landscaping, integrating cactuses and succulents in your backyard landscape should be easy. Although these plants are easy to grow and care for, growing them requires some understanding of their needs. Also, as everyone knows, these plants have sharp spines so they might be a bit difficult to handle. Wear rubber gloves before you start planting these plants in your backyard landscaping. There are lots of ideas that you can incorporate for your cactus garden design in the backyard. Here are some ideas to consider. 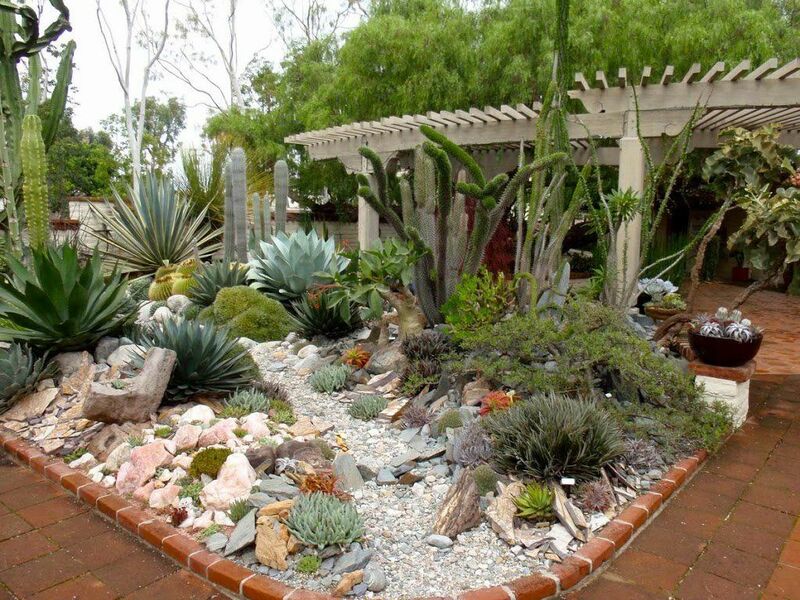 Beautiful cactus garden with hardscape. 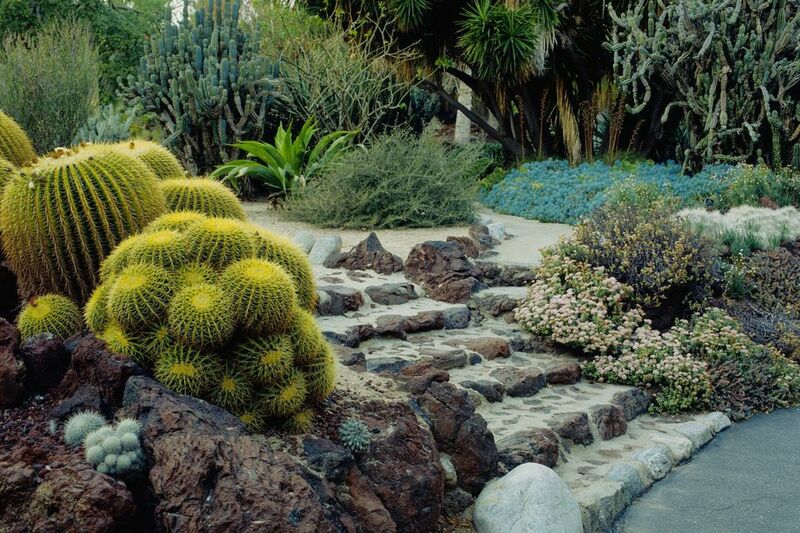 Backyard landscaping of cacti and succulents. 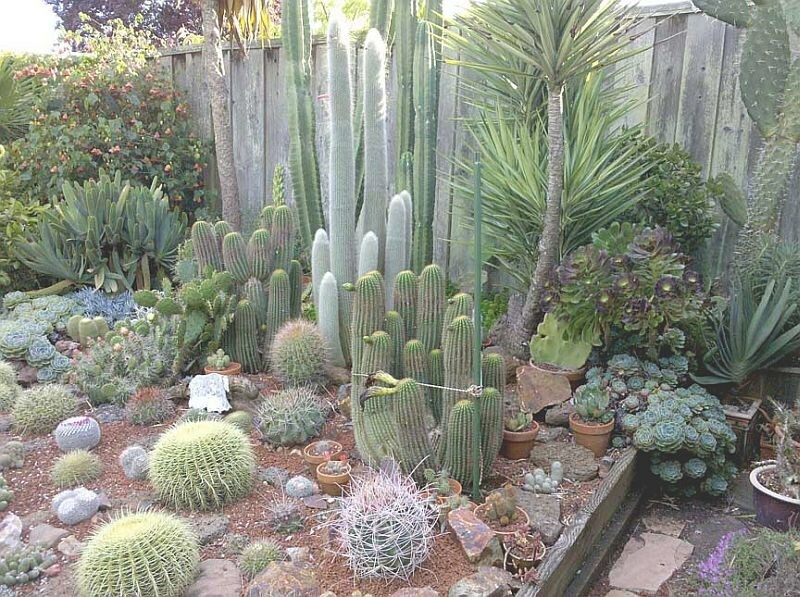 Beautiful garden of large cactus in the backyard. Beautiful backyard landscaping of agave cactus and succulents. Organ pipe cactus in a backyard garden. It’s common to see an outdoor cactus garden, but cactuses can actually grow indoors too. The best thing about these plants is that they can adapt to any kind of environment, which makes them an excellent candidate for an indoor garden landscaping. 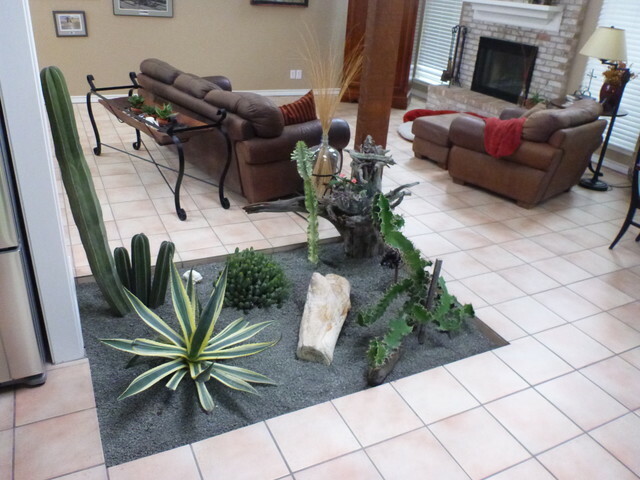 So if you are short of space in your front yard or backyard, then consider coming up with an indoor cactus landscape. Cactuses are among those plants that can survive on little water. But if you want them to produce some flower, you must water them regularly especially during their growing season. When growing them indoors, provide them with thorough watering before planting. This is to help the roots to make good contact with its new soil, allowing the plants to grow well easily. Since most cacti varieties do not want to sit in water, you should provide your indoor cactus plants with proper drainage. If you plan on growing them in containers, cover them with a layer of rocks and pebbles, in order to prevent the soil from clogging the drainage holes. 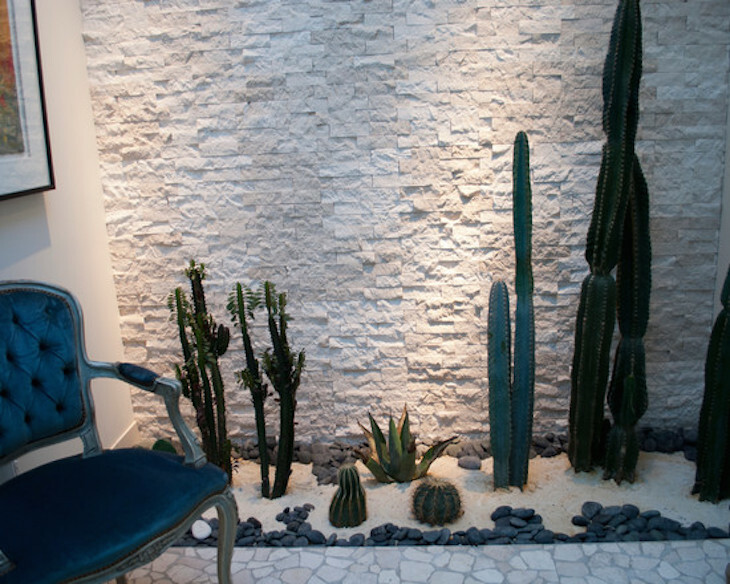 In fact, landscaping with cactus and rocks is also a great idea indoor. If you need more inspiration, check out these indoor cactus garden design ideas. Cactus garden by the bar. Beautiful indoor landscaping of cactuses. Cactus garden in the living room. Mini garden of cactus and succulents by the window. Prickly pear cactuses by the bathroom window. Another great idea for those who want to come up with their own cactus garden indoor is to come up with a mini cactus garden. As mentioned, cactuses do not require a lot of watering and maintenance. Thus, they can thrive well indoors. When creating your own mini cactus garden, it’s important that you look for those varieties that will not grow up so big. You can incorporate succulents in your tiny garden as well in order to make the garden look even more beautiful. 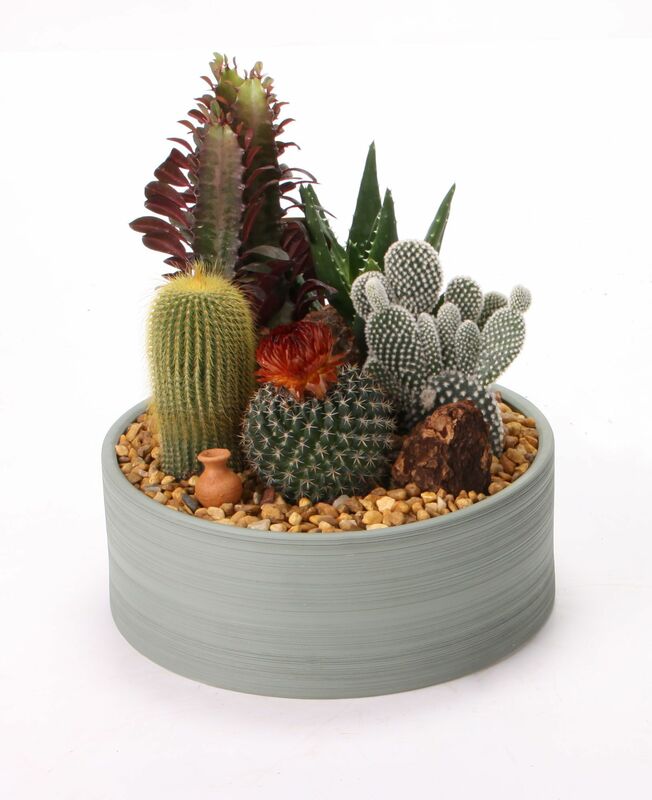 The dwarf species of succulents and cactuses are ideal for your mini garden. These plants can only grow up to a foot and even less. They look so pretty and are available in different forms, some are spiny and others have colors, while there are also those that produces tiny flowers. There are plenty of mini cactus garden ideas that you can take inspiration from. They are often grown in a huge pot, ceramic dish or any type of container. Some designs also have decors, such as tiny butterflies, a fountain and other ornaments. Here are some ideas to get you started with your own mini cactus garden. Cactus and succulent dish garden. Mini cactus garden with fountain. Cactus garden in a large pot. Beautiful cactuses in a cement pot. A mini garden of flowering cactus. 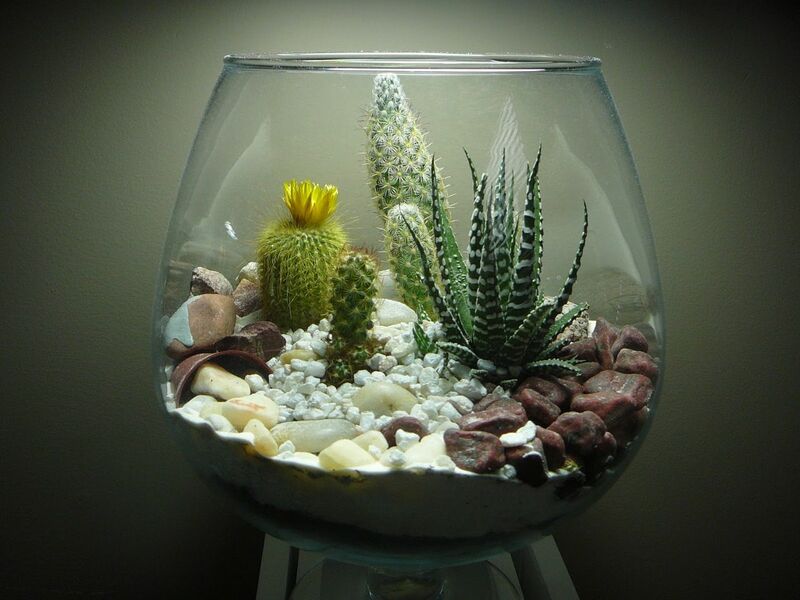 Mini cactus garden in a fish bowl. A modern designed home calls for a modern landscaping design. 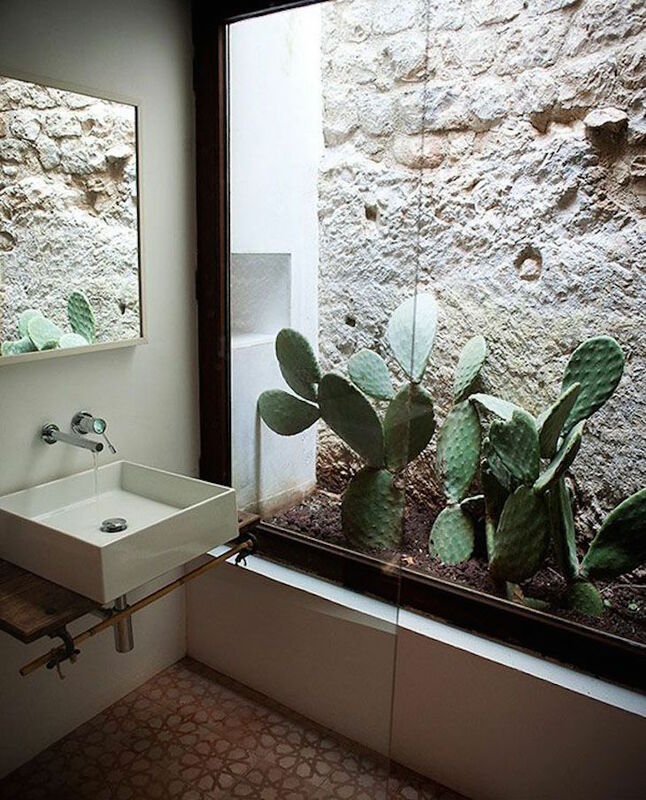 Adding cactuses to your modern landscape can help to warm up an otherwise cold and uninviting place. The emphasis of modern landscape is on crafting a well-organized place in a minimalist approach, and coming up with a space that will not only look friendly, but feel inviting as well. The best way to start with your modern outdoor cactus garden is to neatly organize stiff and structural cactus plants. Opt for a loose and natural planting style so it will be in harmony with the home’s exterior spaces. It should be the kind of landscaping that will utterly reject any link to the natural world. You do not need to get stuck with cactuses. Integrate your design with other loose plantings to create a lively appearance and bring in a sense of warmth and playfulness to your outdoor space. In any modern landscape design, there is often enough organization in the hardscape. Thus, you always have the option to go more natural with your plantings. Consider growing cactuses that produce flowers that blend well with ornamental grasses. You can also integrate perennials to your cactuses, but use them strategically since perennials have the tendency to get a little loose and will mess up your modern landscaping. If you need more ideas and inspiration for a modern designed cactus landscaping, here are some ideas to check out. Naturalistic desert landscaping in a modern designed home. Modern landscaping with a pathway. 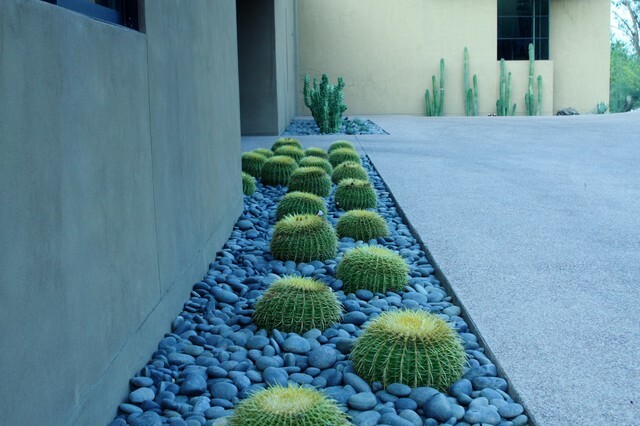 Cactuses are used as edging in this modern landscaping. 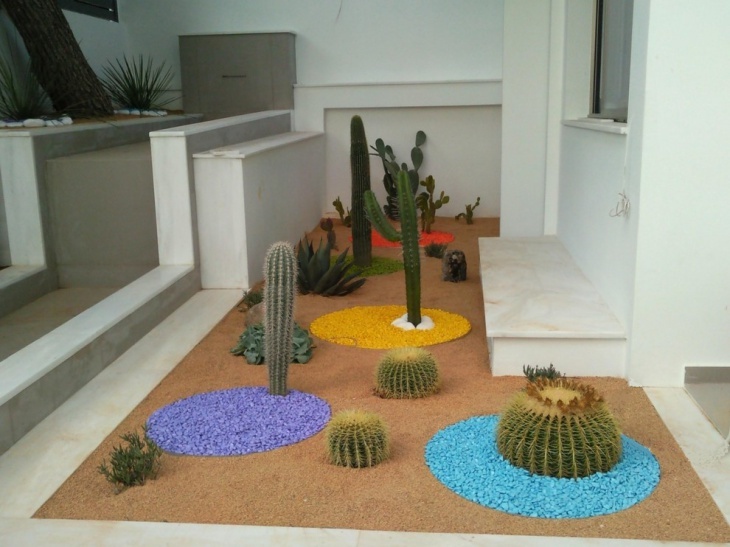 Ultra modern cactus landscape design. 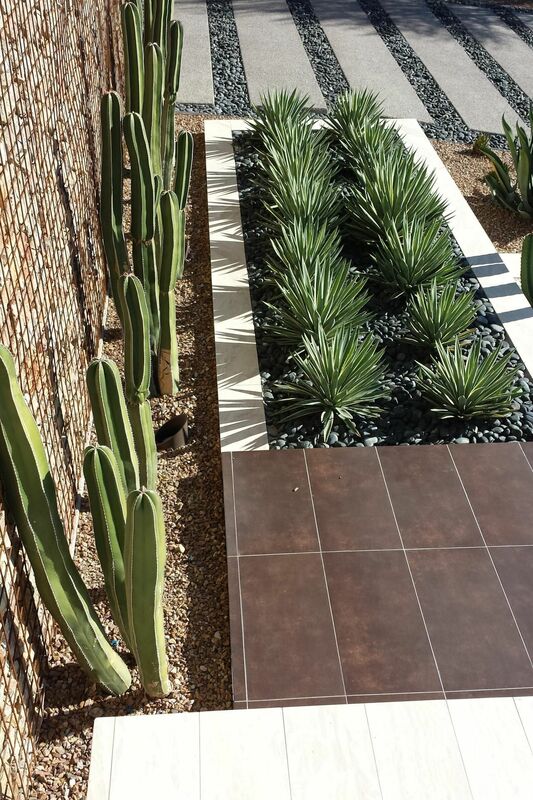 Mass plantings of barrel cactuses in a modern designed home. Water features can help to enhance the beauty and harmony in your surroundings. 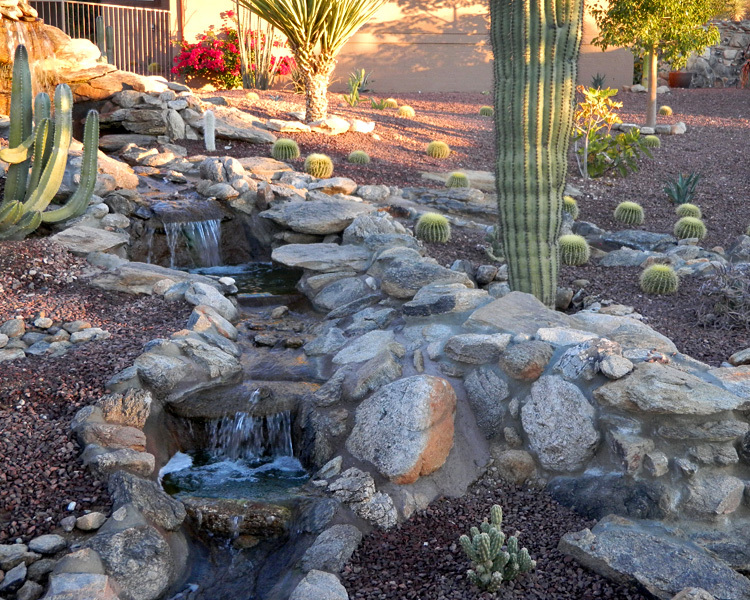 Whether it’s a pool, pond or a waterfall, adding a water fixture into your cactus landscaping is a great idea. Aside from making your landscaping to stand out, water is believed to have a calming and soothing effect. 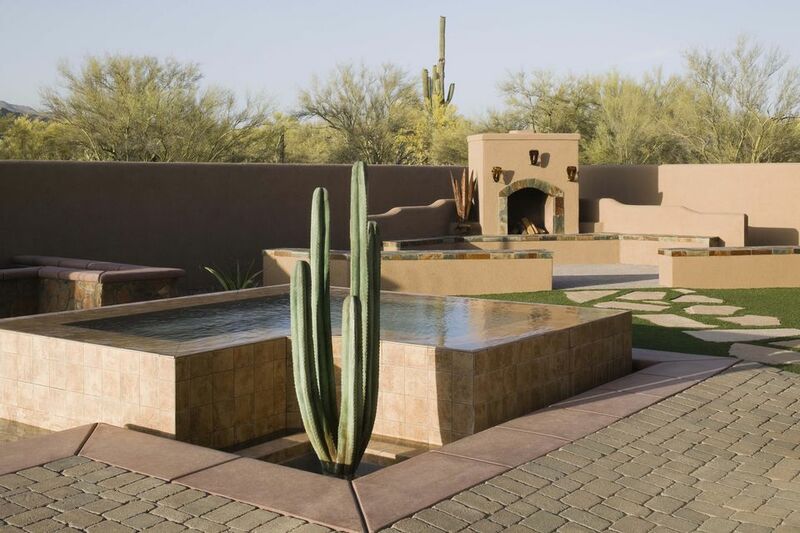 There are various ways in which you can add water fixtures into your cactus landscape. Regardless of the type of water fixtures that you will go for, make sure that you choose something that will blend seamlessly with the rest of your landscape design and provide for a perfect ambiance for the space that you are trying to create. 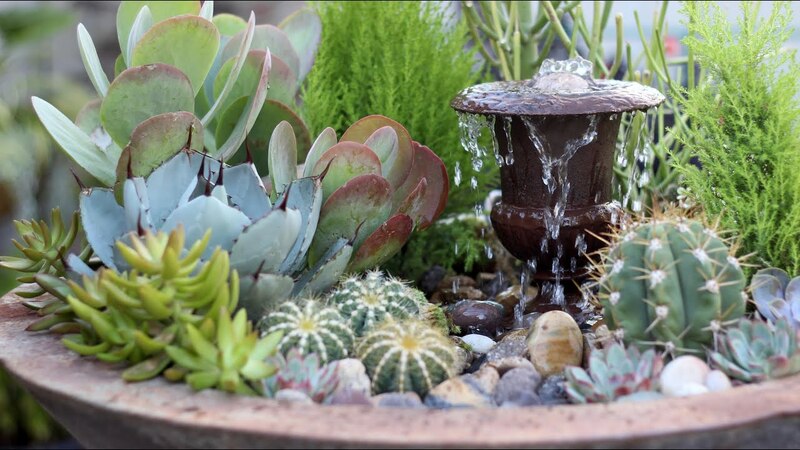 Take a look at some of these amazing ideas on how you can add water features into your cactus landscaping. 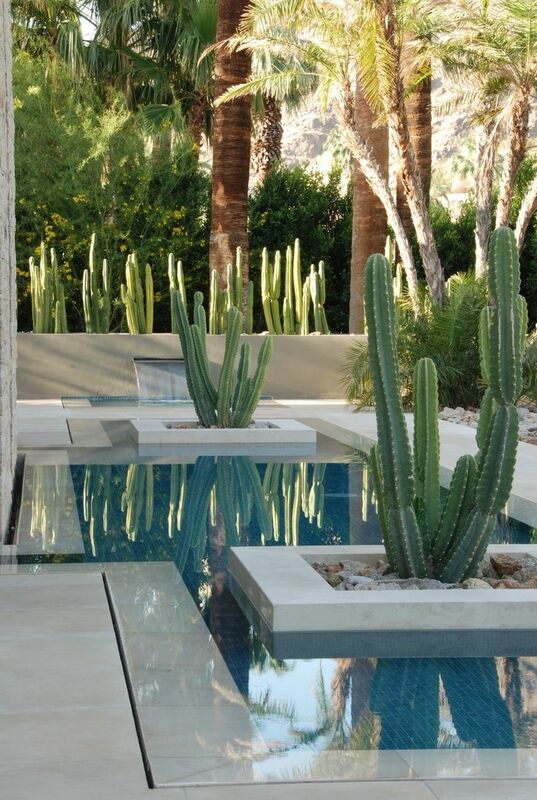 Cactus landscape design in a backyard pond with marble. Hot tub with cactus landscaping. Tall cactuses surround the pool. Cactus landscaping with a rock waterfall. 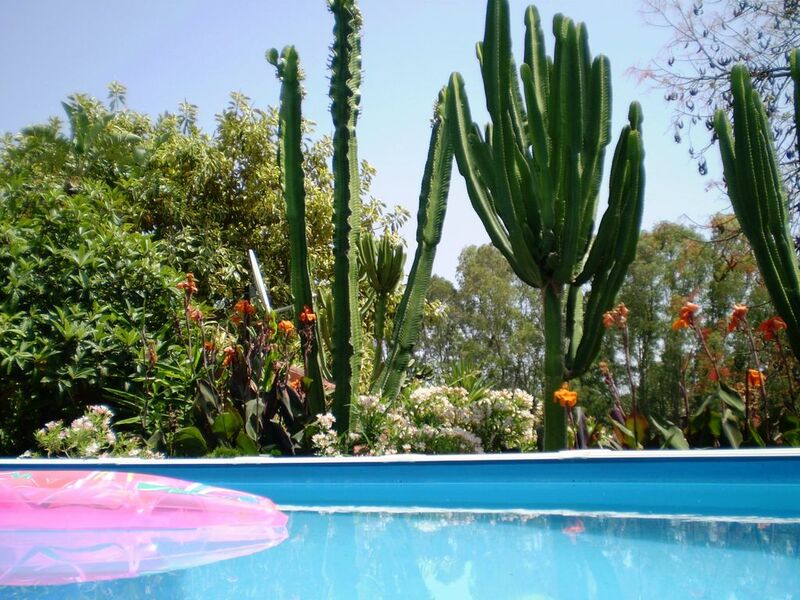 Barrel cactuses help to accentuate the backyard pool. Contrary to what many people thought, using cactus plants for your garden landscaping is actually easy. With the help of the gorgeous cactus garden design ideas above, coming up with your own cactus garden should be a breeze!